Poor Mojo's Classic Squid: Squid "Ask The Giant Squid: LOLPREZIDENTZ--Our Third First Black President?" Ask The Giant Squid: LOLPREZIDENTZ--Our Third First Black President? Over the last year my typist, Jarwaun, and I have made it our habit to "throw ourselves beneath the wheels of the meme-wagon" and compose digital images in the LOL genre, specifically setting ourselves to the project of documenting all "Fifty" of our United States' LOLPREZIDENTZ in such manner, efforts which we have cataloged here. On the eve-week of this tiresomely historical election, Jarwaun happened to mention that next week "probably almost for sure we gonna have us our first real black president." When I asked for clarification on "real black", Jarwaun pointed out that, although Bill Clinton was "one-third black, on account he was adopted by Ray Charles and his grandaddy's great-great-grandaddy was Jamaican," Barack O'Bama would nonetheless be our first "100 percent all full black president." 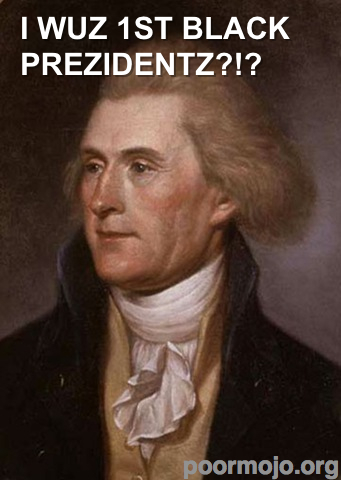 As it turned out, brief research indicated that, at best, Mr. O'Bama could hope to be our Third Black President, having to queue behind first William O'Clin-Ton, and then the venerable Thomas O'Jefferson. It would seem that being the nation's first black president is as venerable an American tradition as devouring mom like she is appled pie. Nonetheless, I offer you this opportunity, my best beloved voting readership, to select your favorite black president, and anonymously proclaim it to the heavens above and Internets at large. Post Scriptorum: It has been indicated by Cecil—the boy who may only live inside of the portal between dimensions found by my accountant Leeks in my Cabinet of Wonders—that there is a fourth potentially black president: Zachary Hayes, our Someteenth President, himself tragically chrono-displaced from 1863 to 1702, inclusive, and forced to be president for six consecutive, and 14 non-consecutive, days within that period. On at least two occasions he was forced to stand as president when he himself was unable to perform his duties as president. He also once presided over a hung senate entirely composed of iterations of himself (the Hung Senate of 1711), and obliged to place the tie-breaking vote. It should be noted that Cecil occasionally suffers from an inter-dimensional variety of nitrogen psychosis, is prone to flights-of-fancy, and that he was (is? shall have had been?) a Know-Nothing Whig in the New York Assembly of 1839. Also, he is currently seven-and-one-half yeas of age, and shall be so for the forseeable future (and past). Such is the lot of boys who wander into portals that lead they know not where. Ask the Giant Squid: Wherefore Hath My Mavericks Gone?